It's hard to imagine a comparison of the delicate nuances of Antony Hegarty, from Antony and the Johnsons, with the type of brashness offered by singer/songwriter Neko Case. But as Antony had used Japanese Butoh theater (mainly through the legendary performer Kazuo Ohno), in which the performer attempts to embody a non-human form, such as wind or darkness, so does Neko Case, with her new release, Middle Cyclone. Case opens with "This Tornado Loves You," a song written from the perspective of a forlorn tornado seeking a lost love (being or otherwise). "I've waited with a glacier's patience./ Smashed every transformer/ with every trailer/ until nothing is standing/ 65 miles wide./ Still you are nowhere/ in sight." And even though the arrangement is in the form of a sparkling pop song, one that is familiar in the Neko Case discography, it is her lyrics that carry an engaging narrative, weaved in poetic, sharp lines. She's an insightful firmly-rooted storyteller, as opposed to Hegarty's ethereal approach. Middle Cyclone travels a wider musical terrain than her triumphant 2006 release, Fox Confessor Brings the Flood. Her smart rendition of "Never Turn Your Back on Mother Nature," originally recorded by the eccentric (and underrated) early ’70s band Sparks, becomes the record's center pin. Case's confidence runs through this entire recording, which she also produced and orchestrated (with arrangements and collaborations by guitarist Paul Rigby). Her attention to sound, feel and song order makes Middle Cyclone a true album, with each song transitioning into another for a complete experience, beginning to end (including the 15-minute "cricket" tape loop finale). The Phil Spector-esque take of Harry Nilsson's "Don't Forget Me," which contains a "piano orchestra" with Garth Hudson playing "lead" piano lines, is surprising, especially in her delicate delivery over this wall-of-sound. Case makes Nilsson's song her own instead of merely replicating it. While the dark yet sensitive "Prison Girls" and "I Am an Animal" hint that she may be allowing the influence of her "other" band, The New Pornographers, into her own songwriting. Her core band of Rigby, Barry Mirochnick (drums), Kelly Hogan (backing vocals), Tom V. Ray (bass) and Jon Rauhouse (guitars) are joined by a stable of musician friends, including members of Calexico, The Sadies, the New Pornographers, Giant Sand's Howe Gelb, M. Ward, Garth Hudson and saxophonist Steve Berlin (Los Lobos, The Blasters). Case assembles this collage of personnel with a creative cohesiveness that allows for a full, yet loose, resonance. 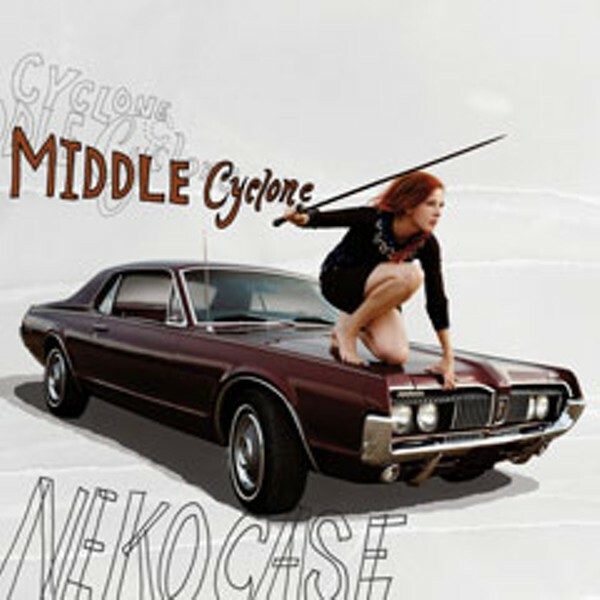 Middle Cyclone stands as Neko Case's strongest recording to date. And alongside her preceding Fox Confessor, it marks a successive artistic high point. Twin peaks, or rather duel cyclones, indeed.